How well do you know Bharat? We all know that India is surrounded by water bodies and the Great Himalayas. But how many of us know that India was once an Island. About 50 million years ago the India continental plate collided with Asia, buckling the coastal area of both continents and creating the Himalayas – the world’s youngest major mountain range – and, of course, the highest. So come join with us in a journey to discover this Great Nation. 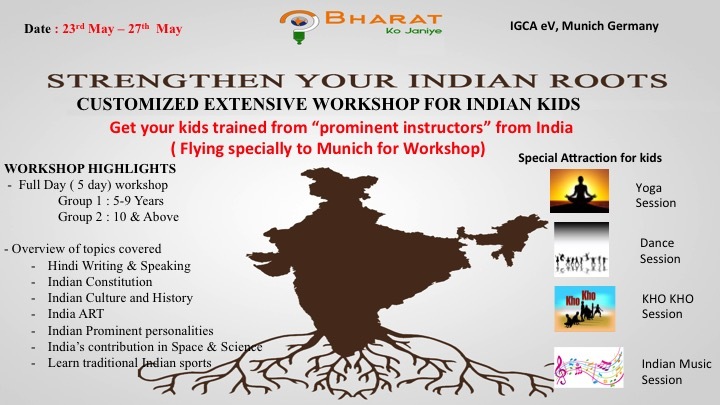 This years Pfingstferein, IGCA eV is organizing a 5 day workshop for kids during school vacation in May 2016 . – Sesions on Hindi( writing and reading),( it will be a small part as we do expect non-hindi speaking people to participate as well). We would keep it simple by following CBSE/ICSE contents as much as possible. Please note their will not be any reference to any religion /caste . We have the intention that next time kids visit India they should be able to connect well with India. The above theme has been designed on the lines of Bharat ko Janiye Program, initiated by the Ministry of Overseas Indian Affairs (MOIA), that connects NRI’s and PIO’s/OCI’s with India. ost of this workshop would be 150 Euros for early birds and 200 Eur for late entrants. ( for 5 days). Lunch could be purchased additionally on the venue itself. Chosen Venue would be approachable via public transportation . – Max Occupancy : 40 Kids ( 20 each group). We are sorry but this event is not yet open for registration.